How many times do you think about what to make for dinner and end up with a seemingly impossible list of requirements for that one meal? It needs to be filling, but without being too full of fat, tasty without being too salty or sugary, balanced and preferably something interesting. Welcome to every weekend of my life! 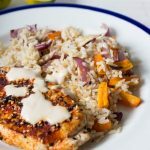 Planning meals is something I can’t live without (see post here if you want some top tips) and I usually do it on a leisurely Sunday morning when I have time to look through my blog, magazines and books for inspiration. More often than not I end up fulfilling all the requirements that I want my dinner to be, but it takes time to work it out. 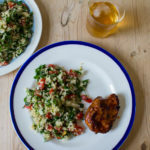 So give my Harissa Chicken with Quinoa, Avocado and Mango Salad a go; I’ve done all the hard work for you. Cook the quinoa according to the packet instructions. While the quinoa cooks, prepare the avocado, mango, onion, chilli and coriander. Once the quinoa is cooked, drain and leave to cool slightly. Squeeze over the juice from the lemon and add a little salt and pepper, mix well. Get a frying pan on a medium heat and add a little oil. Flatten the chicken breasts with a rolling pin between two sheets of cling film then season each side lightly. Add the chicken to the frying pan and cook until it’s turning golden brown and just cooked through. 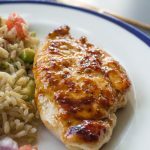 Decant the harissa paste into a bowl then brush it over one side of the chicken breasts, turn over, then brush the other side. They will turn a fantastic colour and the smell is amazing! Let the paste catch slightly on the pan to give everything a smoky flavour. Remove the chicken from the heat. Mix all the prepared fruit and veg into the quinoa then serve up with the chicken on the side. Drizzle over a little plain yoghurt if you like. That’s a fabulous dinner, Caroline. 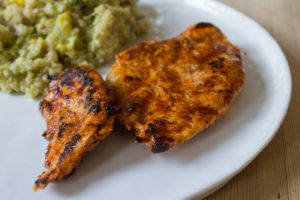 I eat chicken breast very often and this is a great way to prepare them. This looks mouth-watering! I need to try cooking with harissa. The chicken must be so flavorful and love the color. The quinoa salad is just the thing to go with it. I’ll need seconds! 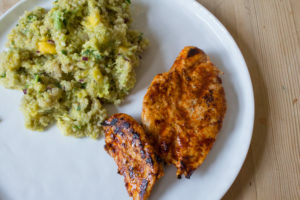 I don’t know which I love more–the flavorful chicken or the fabulous quinoa salad! YUM! Oh I want this for dinner tonight. I love harissa and I am really intrigued by the quinoa, avocado and mango salad, great fun flavors coming together! Caroline, this is my kind of meal. Simple and full of flavors. Healthy and good for you! This will be perfect for dinner! Tons of good flavors going on here! The salad looks wonderful, but the chicken is even better. Can’t decide, so I’ll have both! Thanks so much. This looks amazing! I’m a sucker for anything with avocado, and I love the combination of spices you used! Refreshing delicious salad. My friend just brought me back several perfectly ripe mangos from Cambodia and I can’t wait to try your recipe. Hi Caroline, this is definitely my kind of salad, all of my favorites in one dish, thanks for doing all the hard work for us. Take care.